Folks come to Simpleology looking to solve many problems, but procrastination is perhaps the most common. It stands to reason, doesn’t it? Nothing robs us of our full potential as much as lost time. So, we’re trying a little experiment here. 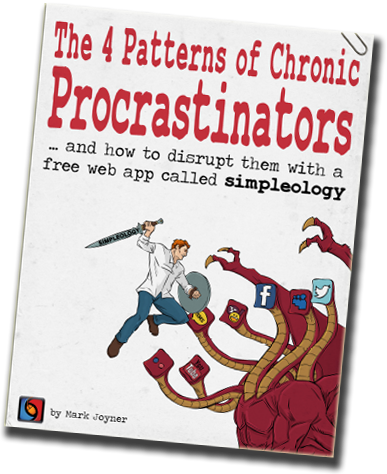 My team and I just put together a little cartoon book called The 4 Patterns of Chronic Procrastinators. Cool – haven’t read a comic for years. ChristianAmador Thanks, Christian. We’ll fix this and re-upload ASAP. I have not yet found all the bugs and cameras you most certainly have hidden around my office, but I’m certain they are there. How else could you have known all those intimate details of my proclivity to procrastinate? Have you been talking to my wife? Scheesh! Ya think I don’t know who “Bob” really is? I’m surprised you didn’t include a disclaimer…but don’t worry, I’m not gonna sue…just gonna go quietly and use Simpleology to “Start My Day”! I am loving the recent communications through illustration. It makes the points easier to absorb and adds visual association, which is powerful. Nice job!!! It reminded me of some things that I could use better and I look forward to the certification! Thanks for the “little” reminders of how I can use Simpleology more effectively to get to my goals! @SueIrwin the certification is going to be fantastic. Here I was hoping for some black and white FAQs. I had my sights way to low. That was the most enjoyable directions I have ever read. @sharethehealth even better stuff on the way! The biggest problem with my using simpleology is that I didn’t understand how to use it. This comic instruction book was very easy to understand and made things seem simpler than I thought. It has renewed my faith in the possibilities of using it daily. Thank you for enlightening me! I look forward to learning more. Brilliant! I’d not used my simpleology account for a while, but I’m back on it now, thanks to this. That was really fun and informative! I actually signed up for Simpleology years ago, but I quit using it because I didn’t have time to figure it all out. This comic made most of the basics very easy to understand. I think I’m going to have to give it another try. @Mom2bjt Excellent – let me know if you get stuck. Thanks once again for showing the example by releasing this so precious document! I’m an unconditional fan for over 3 years now and I can tell you that I’ve never had such a brilliant life ever since I’m using Simpleology everyday! @Fred Le Barman awesome Wait till you see what’s next. Our best thing ever. Hi Mark, Thanks for this wonderful and fantastic pictorial analogy of a Procrastinator thoughts and actions. Your intro to Simpeology makes the whole process of “getting out of our rut” looks simple and easy too! May more people get exposed to this comic of yours so that they change life for the better. May I have the permission to pass this comic around? I’m a big procrastinator, I’ve gotten a lot better over the years thanks to Simpleology. When I don’t use Simpleoogy I fall back into my bad habits. The comic kept me riveted to keep turning the page to see how “Bob” solves his problems! Great job Mark and I’ll keep at my Simpleology because it’s definitely helped me achieve success thus far! Absolutely BRILLIANT! Made me laugh out loud! Love the block website feature. I’m off to stop procrastinating now! Enjoyed the read especially as 3 days ago I was bogged down in clay while digging a ditch! thank you for the download ! Thank you, Mark. Much appreciated! I loved this comic book journey to slay the Procrastination Dragon. And I love the new Simpleology Elite system as well. Hey Mark. I will admit that this is a never ending battle, at least for me. I really appreciate the book and will review it from time to time AND will share it with my friend and family.